Patrick Reid of Ballyhale Shamrocks in action against Portumna’s Eugene McEntee and goalkeeper Ivan Canning in yesterday’s AIB GAA Hurling All-Ireland Senior Club Championship final. Nothing lasts for ever and we know that all good things come to an end. And it did for Portuma yesterday. After 28 consecutive wins in championship hurling, Portumna’s glorious run of success came to a stop in Croke Park on the biggest stage in club hurling. Unbelievably, the Shannonsiders had not been defeated in championship hurling since the county final of 2006 against Loughrea and they have been superb ambassadors for Galway hurling. But their dream of becoming the first team to win three successive All Ireland titles is over, while Ballyhale Shamrocks can celebrate their move to the top of the honours table with five titles, one ahead of Birr (Offaly ). Yesterday the Kilkenny side was first out of the blocks, racing into a seven-point lead after only 20 minutes. Portumna’s first touch seemed to dessert them at key stages and Henry Shefflin had helped himself to five early points in that first half, four coming from frees. Portumna were well beaten at midfield early on and Johnny Kelly rang the changes to try to stem the tide. He moved Eoin Lynch to wing-back in a switch with Gareth Heagney and made a few other moves that will lead to debate, moving Damien Hayes and Joe Canning out of the full-forward line. That perhaps was the wrong road to go down as it took Portumna’s two best goal getters away from the red zone. To be fair to Kelly he had to do something as Ballyhale’s Michael Fennelly and James “Cha” Fitzpatrick were utterly dominant around the middle. That meant the supply into Portumna’s inside line was disjointed and irregular. Fennelly hit four wides and yet his work-rate was crucial to Ballyhale winning the 2010 title. Indeed the Kilkenny champions hit a total of 12 wides and, had they been a tad more efficient in front of goal. they would have won by a far wider margin. It felt strange looking down at the pitch midway through the first half and seeing Joe Canning out at wing-forward. That said Canning was superb yesterday and he showed tremendous leadership all through. The youngest Canning scored 12 points and some of his scores from play were stunning efforts. He, more than any other Portumna player, did not deserve to finish on a losing side. To prove the point about his herculean effort for his team - Joe scored his side’s first three points - the third was a terrific individual effort. He almost single-handedly pulled his side back into the game in the second half, scoring Portumna’s first five points in a row after the small whistle. No doubt John McIntyre will be delighted to welcome him back to the county fold. Damien Hayes did hit Portumna’s last two points just before half time to leave his side six behind, 0-11 to 0-6, but things looked ominous for them even at that stage. They tried hard in the second half, but there can be no doubt that Ballyhale were the better side. Up front their men all hit top form. King Henry hit eight points, and TJ Reid and Eoin Reid collected 0-3 each, while David Hoyne was on hand to score a crucial goal and capitalise on a major hand-pass error by Ivan Canning. Revenge was a key factor for Ballyhale. Their hunger and work-rate was top class and they hunted in packs. Massive pressure was always being put on all the Portumna players when they were in possession and they never looked like getting the goal or two they needed. Their over-dependence on Joe Canning came back to haunt them in the last quarter as it allowed Ballyhale to double mark him when the game went into the vital final few minutes. On one occasion there was seven Ballyhale defenders covering and two Portumna forwards. How were Portumna going to get the goal they needed in that scenario? There will be no complaints from Portumna. They have been superb champions and they will be the first to acknowledge they did not play up to form. They looked a touch off the pace and, against a Kilkenny team smarting from leaking five goals last year, it was always going to be difficult. Portumna can rise again. It will not be easy, but no club side in Galway will feel they will go out and beat them easily based on what happened against Ballyhale. 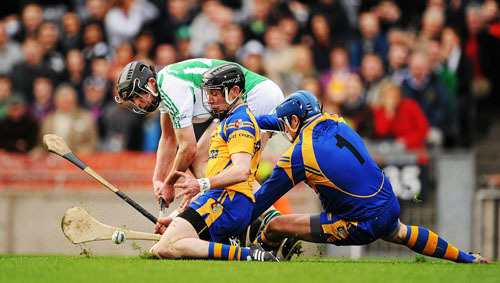 Portumna were beaten and lost their All-Ireland title. But they have not gone away. Portumna: Ivan Canning, Aiden O’ Donnell, Eugene McEntee, Ollie Canning, Gareth Heagney, Mike Ryan, Peter Smith (0-1 ), Leo Smith, Eoin Lynch (Cpt ), Niall Hayes, Kevin “Chunky” Hayes, Andy Smith (0-1 ), Damien Hayes (0-2 ), Joe Canning (0-12, 6fs, 1, 65 ), Martin Dolphin (0-1 )– Subs: Ciaran Ryan for N. Hayes (44 mins ). Ballyhale-Shamrocks: James Connolly, Alan Cuddity, Aidan Cummins, Padraig Holden, Paul Shefflin, Eamonn Walsh (Cpt ), Bob Aylward, James “Cha” Fitzpatrick (0-2 ), Michael Fennelly, Colin Fennelly, Henry Shefflin (0-8, 6fs ), T.J. Reid (0-3, 1 s/l ), Eoin Reid (0-3 ), Patrick Reid (0-1 ), David Hoyne (1-1 ) – Subs: Joeseph Holden for M. Fennelly, Mark Aylward (0-1 ) for P. Reid. Page generated in 0.1226 seconds.